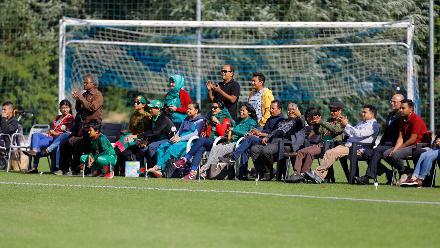 Match 11: Bangladesh v United Arab Emirates Women, Group A, ICC Women's World Twenty20 Qualifier at Utrecht, 10th July 2018. 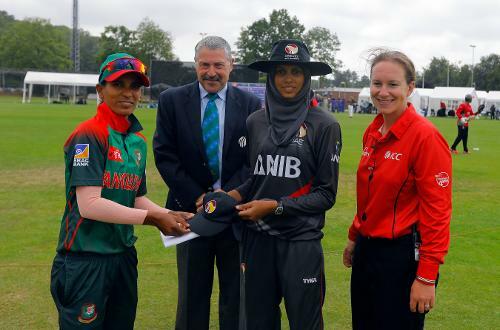 Bangladesh Capt Salma Khatun and UAE Capt Humaria Tasneem ready for the Toss, 11th Match, Group A, ICC Women's World Twenty20 Qualifier at Utrecht, Jul 10th 2018. 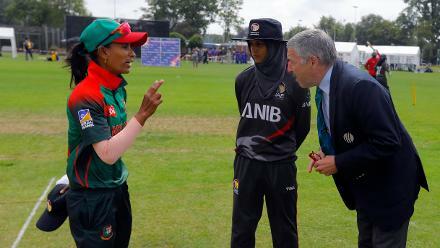 Bangladesh Capt Salma Khatun and UAE Capt Humaria Tasneem and Referee Jukes are ready for the Toss, 11th Match, Group A, ICC Women's World Twenty20 Qualifier at Utrecht, Jul 10th 2018. UAE Batsman CR Seneviratna plays a shot, 11th Match, Group A, ICC Women's World Twenty20 Qualifier at Utrecht, Jul 10th 2018. UAE Batsman ER Oza plays a shot, 11th Match, Group A, ICC Women's World Twenty20 Qualifier at Utrecht, Jul 10th 2018. CR Seneviratna is run out (Rumana Ahmed), 11th Match, Group A, ICC Women's World Twenty20 Qualifier at Utrecht, Jul 10th 2018. 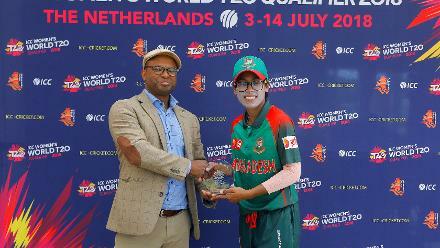 Nisha Ali c Nigar Sultana b Fahima Khatun, 11th Match, Group A, ICC Women's World Twenty20 Qualifier at Utrecht, Jul 10th 2018. 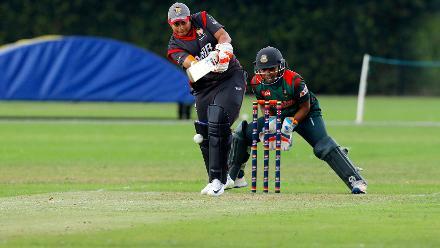 UAE Batsman Udeni plays a shot, 11th Match, Group A, ICC Women's World Twenty20 Qualifier at Utrecht, Jul 10th 2018. 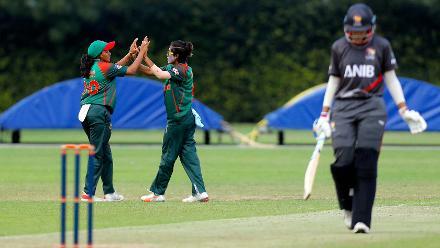 Fahima Khatun celebrates the dismissal of ER Ozha, 11th Match, Group A, ICC Women's World Twenty20 Qualifier at Utrecht, Jul 10th 2018. 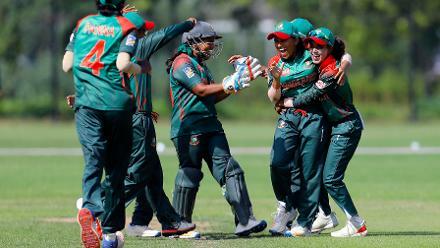 Fahima Khatun celebrates the Hat Trick with her teammates, 11th Match, Group A, ICC Women's World Twenty20 Qualifier at Utrecht, Jul 10th 2018. 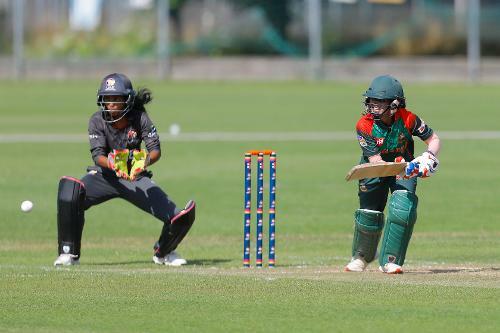 Bangladesh Batsman Jyoti plays a shot, 11th Match, Group A, ICC Women's World Twenty20 Qualifier at Utrecht, Jul 10th 2018. Sanjida Islam plays back up the pitch, 11th Match, Group A, ICC Women's World Twenty20 Qualifier at Utrecht, Jul 10th 2018. 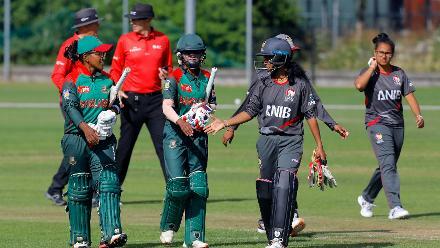 Bangladesh win over UAE, 11th Match, Group A, ICC Women's World Twenty20 Qualifier at Utrecht, Jul 10th 2018.